This is a guest post from the Price Brothers. 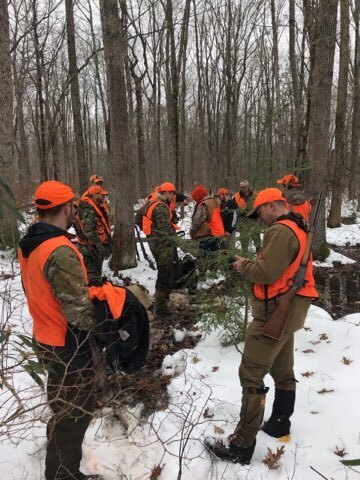 Scott and Ryan Price have grown up in the woods of northeastern Pennsylvania, in a family that lives for hunting. Follow along with them on Instagram at "Price.Brothers.Outdoors"
Killing black bears on a consistent basis is not an easy task for most people. 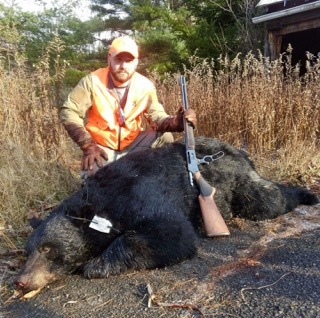 In a state where baiting and hounds are not legal for bear hunting your options are solo hunting or making drives -- we opt for the latter during our 4-day Pennsylvania gun season. Driving bears fits our motto of "making something happen," rather than hoping something happens. 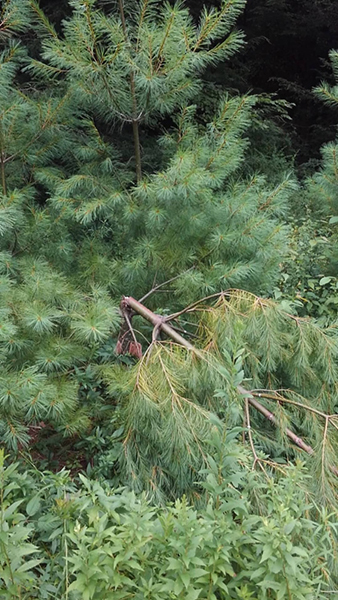 With our proven success in the bear woods, we want to help you put the odds in your favor for tagging a bruin. We were fortunate enough to grow up in a family where hunting was only a half step behind family on the priority list. 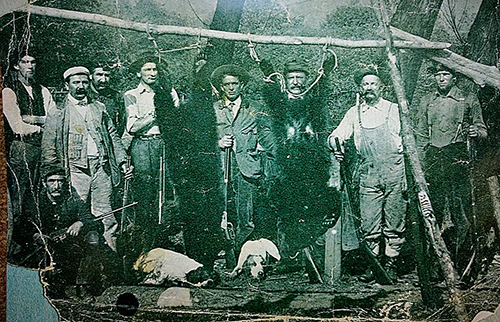 We still hunt on the same ground that our ancestors did over 300 years ago (see photo from 1906). Growing up in this family meant that we already had a gang to be a part of, but if you're starting from scratch, you'll want to follow a few of these tips. Just because you have a buddy who kills bucks regularly doesn't meant he'll be good for bear camp. We have a lot of friends who are great deer hunters but we wouldn't have them in bear camp because it's a completely different type of hunting. If you don't like sweating, being cold, going over the top of your boots in swamps, ripping your clothes, waking up sore, having greenbriar rip your cheeks and ears open (the list goes on) then your name won't be on our roster. All of these things will surely happen, but you probably won't ever know who it happened to because no one will be whining about it. In fact, we love it. You also want to build a gang made up of hunters who can commit to all 4 days of the season. Next, and a HUGE point to make, if you kill a bear on the first drive of the first day you better expect to be busting brush for the remainder of the season. Don't skip out on your gang just because you tagged out. Lastly, and of course, most importantly -- you have to have a group of hunters who put safety above anything else. We have let 600 pounders pass through standers because of unsafe shots, we have let bears run through standers only to run over to someone not in our gang due to unsafe shots, but there isn't an ounce of regret there. No bear is worth an accident (side note, we killed that 600 pounder that got through the standers on the next drive). When we hunt bears we target the nastiest terrain and cover we can find. If it has food in and/or around it, then it goes to the top of the list. Oaks, beech nuts, alder, apples and hickory nuts are some of the natural food sources we look for. When looking for good bear cover we look for rhododendron banks, scrub oak, laurel patches, huckleberry and hemlock swamps. Some of our drives are thick rhododendron on 40% grade banks just 1/4 mile from large developments, where the bears go out at night and pick through garbage, while other spots are scrub oaks patches 2.5 miles back on public land with acorns and beech as the food source. A good spot is a good spot, and if we see potential for bears to be there, we're going to bust it out. When looking for bear sign, we looks for broken off trees, chewing/scratching trees, tracks and of course big ol' piles of crap. Bear's that have a dedicated food source like corn will take the same path, stepping in the exact same place, on the way to and from the destination creating dead spots in the grass. This is much more common in farm country where a bear goes to and from the same field each day. Woods bears are the wandering type because of food being all over the place, so this type of sign is nearly unheard of outside of farm country. When planning a drive, we try to setup so the end of the drive is closer to the trucks. There's no reason to drive bears farther away from the vehicle unless that's the proven direction the bears go in the past. 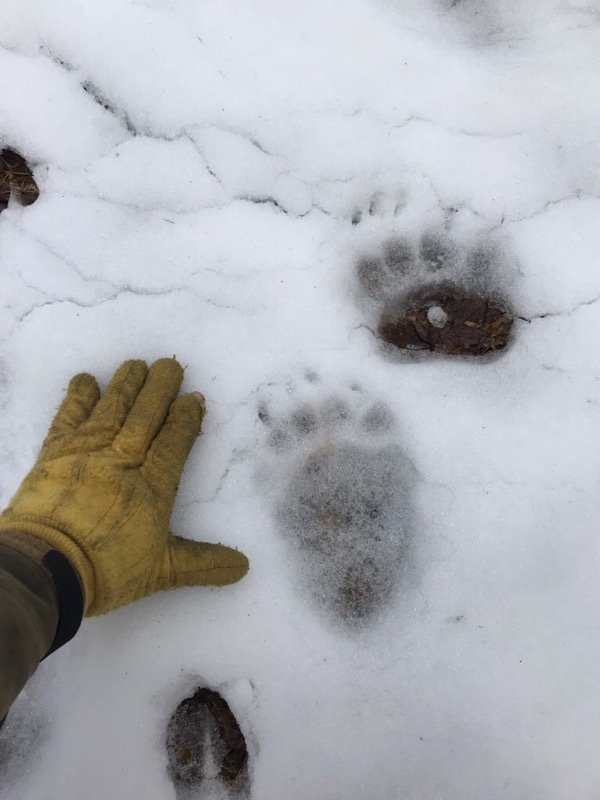 Bears tend to "slink" from one patch to the next following cover or low spots. (This doesnt mean a bear wont run up and over a ridge if that's the shortest path to the next patch of cover though.) As a result, this is where we place our standers. We have some proven drives that are quite large, but because of years of success, we could effectively stand a 20+ acre patch with 2-3 standers because we know where they come out. Always take note of where bears come out of a drive and what happened before they came out. Did it come out slowly? Running? Was it shot at and missed before coming out there? These are huge things to consider. Many people ask if we take wind into consideration. The short answer is no. Bears are going to go where they want to go for the most part. When we are setting up the drives, we try to do as much planning as we can while in/at the trucks. We don't want to be talking and planning as we are standing next to the patch we plan to drive. Several bears have been killed while walking in to get setup, so, this is exactly why we remain as quiet as possible. Always be ready! We also use 2-way radios during setup and completion of drives. The last thing you want to do is start the drive and not have your standers ready on the other side. Whoever is taking the standers around to the end of the drive will give a call on the radio letting the drivers know they are set. Conversely, at the end of the drives, the drivers will let all standers know that the drive is complete. There is an unsaid rule that unless you're saying something important, stay off the radios. Keep in mind, each time a radio transmits a message it is making noise at the exact location of each stander, which can ultimately cost them a shot opportunity if a bear hears it. During drives we are usually "hooting" as we work through the cover. It's extremely important to note the reason for this is not to scare the bears, it's to keep the drivers in line. Although, I'm sure it helps a little bit to move the bears along! Any gaps between drivers will allow bears to get back through. We have seen this happen MANY times. "Making some noise," as we call it, gives adjacent drivers an indicator of where you are so we can constantly adjust our spacing as we progress. Some drives have extremely steep banks and we sometimes hear newer guys say, "you can't even walk on this, I'm going to move up above this ledge"... Nope, stay down there. Our 57 year old dad can do it, so hang on to the brush and keep moving. A bear will run that sidehill every time to evade us, so you need to cover it all. It can be easier to get on your hands and knees and crawl through drives rather than try to bend over for a half mile or more through the brush. Some of our drives parallel other drives. In these cases, it's a bad idea to make a lot of noise because there is potential to bust bears out of the next patch by mistake. On these close quarter drives, the drivers make much less noise, often just whistling or "tree knocking" as we move along. The staple of our bear camp is the lever action rifle. These reliable and handy rifles are perfect for the dense cover that we hunt, and with an overall length of around 40" or less, there is little issue getting them through the "rhodys." Only a few of the 80+ bears we've killed in the last 25 years been shot farther than 50 yards, further proving the demand for fast handling rifles. What you won't find on the rack is a "pretty gun." 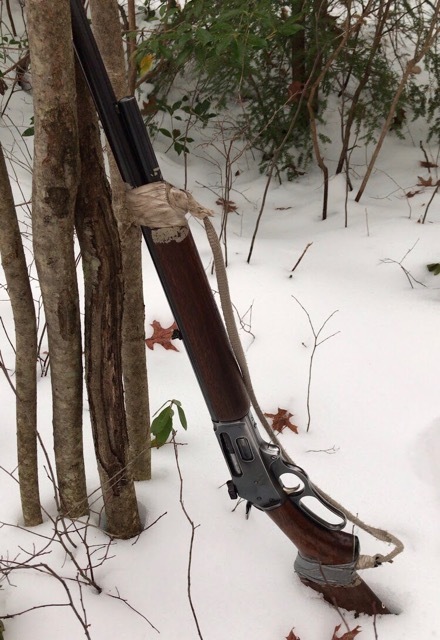 These scarred and weathered rifles have been carried through the woods for 60+ years in many cases. The JM stamped, Marlin Model 336 is the chosen gun in camp with 30-30Win and 35Rem topping the popularity charts. You'll also find a few .444, .450, 45.70 and a lone .375 in the group. Iron sights are also popular in camp, but, since we began using red dot sights like the Burris FastFire, we are seeing growth in that area. The short shot windows we experience make fractions of seconds crucial to getting clean shots off. In our opinion, a red dot is far and away the best sighting options for this. Having a single point of aim, rather than needing to align a front and rear sight sped up our shooting noticeably. Faster target aquisition with the red dot is extremely attractive for tight cover and moving game and its becoming a preferred alternative to irons in our gang. Our chosen sight is the Burris FastFire3 because of the compact profile and adjustable 3MOA dot brightness. They also have a "Forever Warranty" which covers, quite literally...ANYTHING, aside from deliberate damage and theft. More often than not we set the dot on "medium" which still allows for fast pickup to the eye but reduces the starry effect which can happen when the dot is set too bright for conditions. The FastFire also has an automatic mode which works great for most lighting conditions. In deer season when still-hunting by ourselves, the 3MOA dot still allowed for precise point of aiming out to 200 yards or so, which is farther than we'll likely ever shoot around here. It's a great option for woods hunters, trackers and fast shooting situations. Your equipment is ultimately your preference. There are some guys in camp who use bolt guns with scopes. One of those men has killed 12 bears with us. The bears seem to love running to him and he doesn't miss. We are here to share our experiences and what works best for what we do. I'd be willing to challenge anyone to find an activity that builds a sense of camaraderie like bear season does. There is nothing like crawling through rhodys, sweating, cursing and bleeding and then hearing a shot ring out from one of the standers. Immediately you have a full tank of energy, the drivers shout in excitement and you can charge through the rest of the drive like it's a paved sidewalk. Everyone gathers around the bear to congratulate the lucky hunter, hear the story and prepare for the drag out. Those moments after the kill are far and away the best memories we will carry with us in our hunting careers. The tradition in our family bear camp is something that we hope to carry on for many more generation. We live for these 4 days each year. Gather up some buddies, come up with a plan and go pound some brush next fall, you'll be happy you did.